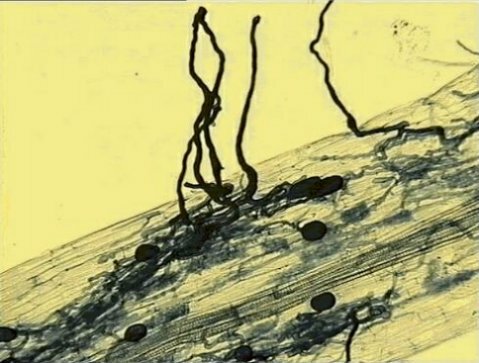 This microscope image shows an arbuscular mycorrhizal fungus in a clover plant's roots. The microscope picture above shows you a clover root (the mostly transparent material in the picture) whose cells have been “infected” with a fungus (the thick, dark material in the picture). At first glance, you might think the fungus is a parasite that takes nutrients from the plant, but that’s not really true. While the fungus does take nutrients from the clover, it also supplies the plant with critical nitrogen- and phosphorus-based chemicals that the plant has a hard time extracting from the soil. This is a mutually-beneficial relationship, which is often called a mutualistic relationship. As anyone who has read this blog for a while knows, I am fascinated by such relationships. I have blogged about them many, many times before (see here, here, here, here, here, and here, for example). In fact, I have blogged about this specific kind of mutualistic relastionship before. It is called a mycorrhiza, and it is very, very common in nature. About 95% of all vascular plants develop mycorrhizae,1 and these relationships come in many different forms. For example, in the relationship shown above, the fungus forms a highly-branched structure called an arbuscule, which comes from the Latin word arbusculum, which means for “little tree.” This arbuscule is formed inside the walls of the root’s cells, and the fungus is called an arbuscular mycorrhizal (AM) fungus. Such fungi cannot exist by themselves. They can only exist as a part of a mycorrhizal relationship. There are other forms of mycorrhizae as well, but the study I want to discuss is specifically about AM fungi. In the study, Zdenka Babikova and her colleagues wanted to see if AM fungi helped plants communicate with one another. They state in their paper that evidence has been mounting that such fungi might transport chemical signals from one plant to another, and they wanted to determine whether or not this actually happens. They set up experiments in which 5 plants were arranged in the same soil so that there was a central plant with four plants surrounding it. The roots of one surrounding plant were allowed to grow freely, and as a result, its roots mingled with the central plant. In addition, an AM fungus was in the soil, and the plants shared that fungus as well. Two of the other surrounding plants had their root systems restricted by a mesh that was too small to allow the roots to pass through, but was large enough to allow the the fungus to pass through. As a result, their roots did not mingle with the roots of the central plant, but they did share the fungus with the central plant. Finally, the roots of the fourth surrounding plant were restricted by a mesh that was too small to allow the roots and the fungus through. As a result, it had no root or fungal connection to the central plant. 1. One plant was connected by both roots and the fungus. 2. One plant was connected by the fungus alone. 3. One plant had been connected by the fungus alone, but that connection had been severed. 4. One plant had no connection with the central plant, other than the soil in which it was growing. So the plants can use the filaments in the body of a fungus to communicate with one another, letting others in their group know about impending danger! In other words, the fungus serves as a network that links the plants together, allowing them to communicate. What does that sound like to you? It’s an underground internet, and it existed long before the internet you are currently using did! I think God designed his creation to work together, and I think that the mutualism we see today is a reflection of that design. Here we see yet another reason God might have designed living organisms to cooperate – so that communication can be enhanced! As time goes on, I suspect we will learn that many other forms of communication take place via this underground internet, and while Al Gore might one day say he took the initiative in creating it, I think it is clear who really deserves the credit! 1. Fungi in Ecosystem Processes, John Dighton, Ed., Marcel Dekker 2003, p. 100. 2. Zdenka Babikova, Lucy Gilbert, Toby J. A. Bruce, Michael Birkett, John C. Caulfield, Christine Woodcock, John A. Pickett, David Johnson, “Underground signals carried through common mycelial networks warn neighbouring plants of aphid attack,” Ecology Letters 16(7):835–843, 2013.